Well one only has to look for accommodation especially of the self catering variety to note the plethora of pet friendly options available ! And more and more people are taking their dogs on a road trip,but lets take a cautionary step back and look at the best way in whoch to do this without inconvenience to one’s best friend. One along trip it may be necessary to lightly sedate a dog to keep it calm,your vet will be able to supply a safe homeopathic option to keep Fido relaxed. Then ensure that you have a bowl,water and dry pet food available,some dogs opt not to eat whilst in a car but others carry on as normal. It’s best to cover the seat with and old bath towel or blanket and if the forecast is for hot weather keep a spray bottle of water as you may need to cool a dog down,try and keep the dog out of the sun even if it means putting a towel in a window to block the sun,one can also purchase the stick on screens used for babies. Be mindful of the breed a dog such as a Pekingese or Pug with a short muzzle may develop breathing problems as their throats and creating passages are smaller- these are known as brachycephalic dog breeds and include Bulldogs and Boston Terriers as well . These dogs are more prone to heatstroke as are long haired dogs- it’s worth running the air conditioning and ensuring that the cabin of the vehicle is cool at all times. Avoid opening windows unless you are travelling slowly without traffic, that being said the dog should be restrained for safeties sake as well. On long trips I always stop every two hours to stretch my legs and get some fresh air,when you stop put your dog and a lead and allow it to walk around as well as have a drink and perhaps do it’s business ( clean up afterwards). 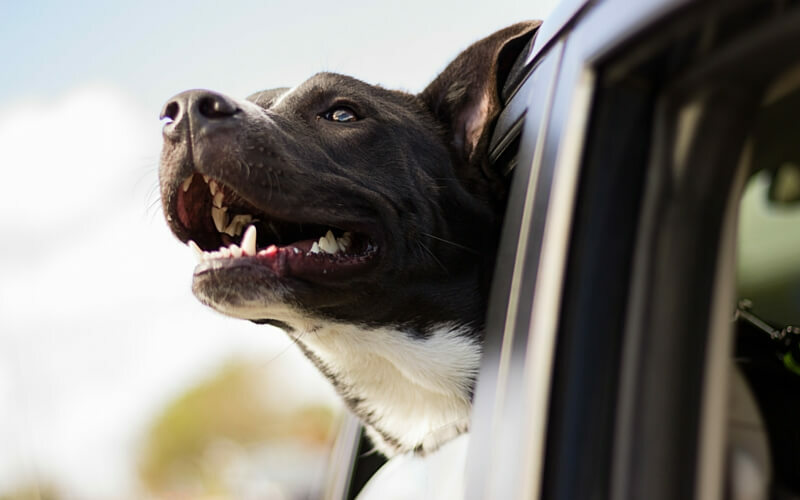 If you can travel when it’s cooler as dogs do feel the heat – check that they do not start panting more than usual which would indicate that they are hot. Lastly never leave the dog in the car even with the windows slightly open, they can succumb to heatstroke in roughly 15 minutes in our climate. Ensure that you take the dogs bed,bedding and toys as these are “comfortable” things which make staying over in unfamiliar territory much easier.Maintain routine such as play sessions and walks,if you dog is socialised and walks off lead just be sure of other animals and livestock in the vicinity, I tend to opt for the “Pet Friendly” options that are fenced in so that I can relax with my pet and enjoy the break without undue worry.